I have several internet orders in transit for the replacement of 1/32″ end mills which I use (and break) for the fine detail fretboard and headstock routing of inlay channels. 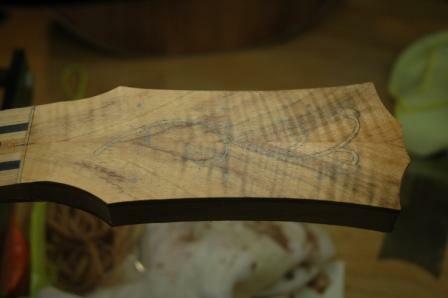 Once received I will be able to finish the routing, then inlay the “vine and thorn” shell which was chosen for this guitar. I was able to complete the bulk of the routing using a 1/16″ end mill, but will need to use the 1/32″ for sharp ends of the thorns. The next picture is a closer look, where you can see the unfinished thorns and leaves. 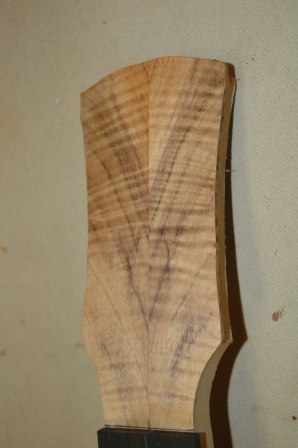 I worked very carefully on the koa headstock (after practicing on the ebony fretboard) as any gaps between the shell and the koa are hard to hide. 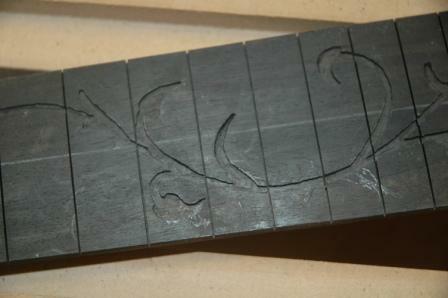 The ebony is more forgiving as the black epoxy adhesive dries to be virtually identical to the ebony, thus invisible. 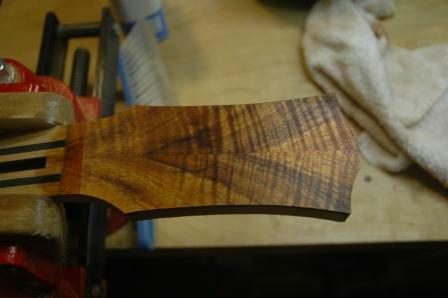 I use clear epoxy mixed with koa powder (from sanding) and will be nearly the color of the headstock but less invisible. The following shows what it will look like with the shell inlayed and the remaining work with the 1/32″ end mill to fully open the channels for the leaves and thorns. 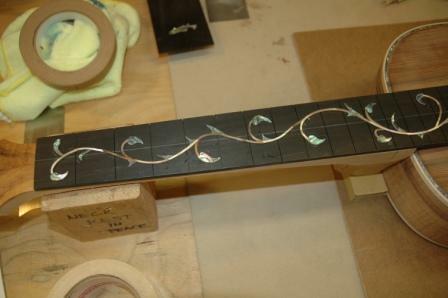 I had the honor of taking an inlay class from Rick Davis at Sound Guitar Workshop. The customer for guitar 905 wants a custom inlay of his baby’s handprint, and I have not yet ventured into the cutting of shell. The class was an excellent introduction to design, cutting and inlaying. We itemized the necessary tools and jigs, of which I have procured a jeweler’s saw, 3/0 blades, some “Burr Life” blade lubricant, and have constructed a jig/platform for the cutting of shell. 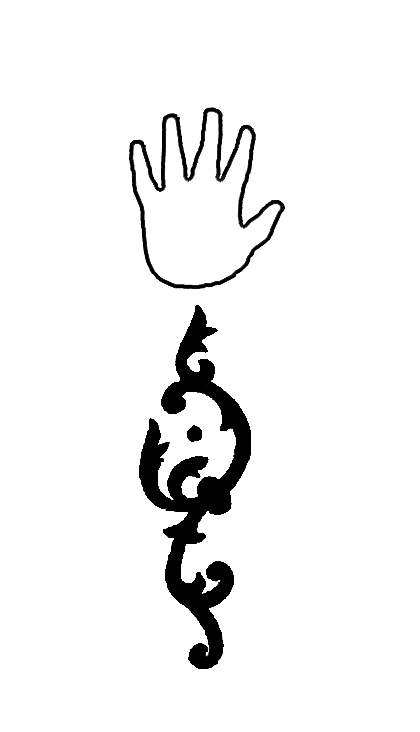 The customer has given me a jpeg with the handprint which I will use as the outline to cut the shell. I’ve ordered shell blanks which are in transit. 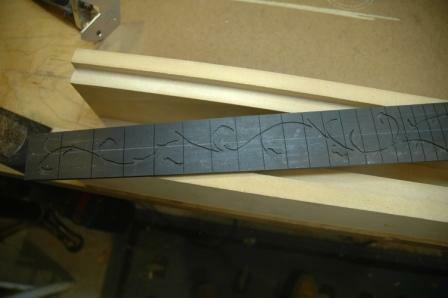 This torch inlay will be used on the fret board. The handprint was turned into an outline on photoshop by good friend Tom. I will print it, then glue it to the surface of the shell as a guide to saw. Here’s my public accolade to Cat Fox for the fret class she gave tonight. Great stuff, I learned a lot. I used to hate the final setup, the fret dressing and polishing etc., but tonight’s class gave me the right focus and technique to complete the job. Oh boy I’m so excited. I took Carol’s guitar with me to the workshop and now I have a very level, very shiny fret job on her guitar. I’m going to call Beth and get her to bring her guitar in for the dressing of it’s life. 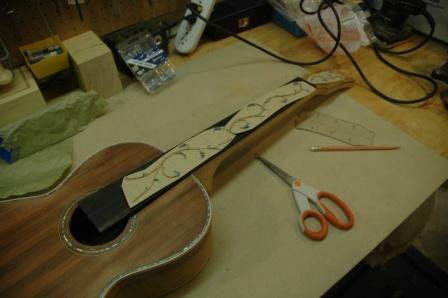 Worked on the fretboard and headstock inlay by gluing the pieces to the surface and then tracing a pencil line around the shell. Look closely to see the pencil lines in the peghead. I will use the Dremel to route out a channel to these lines. 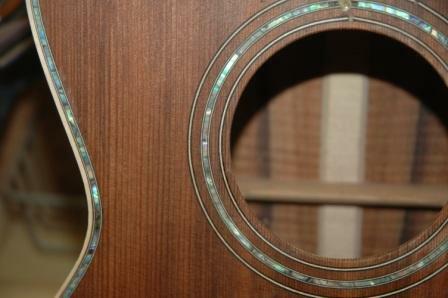 This is the inlay glued to the fretboard. 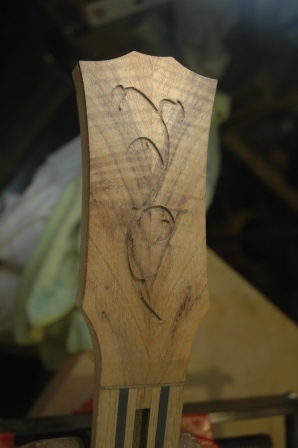 A pencil line is scored around the inlay, then the inlay is removed. I returned the inlay to double stick tape on masonite to maintain the pattern. 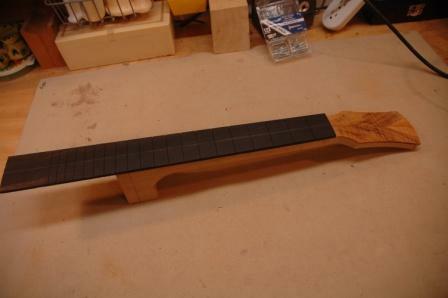 I used the Dremel with a 1/32″ bit and started routing the fretboard. About 20% into the full pattern the bit snapped. $25 down the drain. I used the 3/64″ bit and got to 70% of the pattern and the bit snapped. Goodbye another $25. This is the second go around for both these bits and it wasn’t because I wasn’t careful. I think that if these things are going to keep snapping, I should only have to pay a few bucks for each. Crap. Well, since I know of no local source, I’ll have to order and wait for delivery before I can continue. 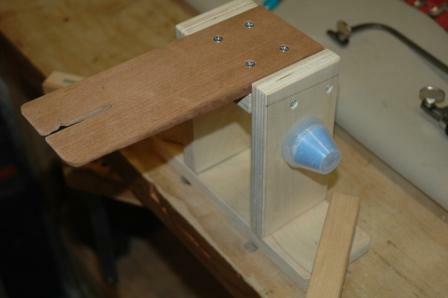 Continuing the process of bringing the box down to the final sanding stages. Still a few small gaps to fill with epoxy, but it is ever closer to being smooth and ready for the neck fitting. I’ve got the top mostly fair and square, making sure there is no glue residue still on the surface. 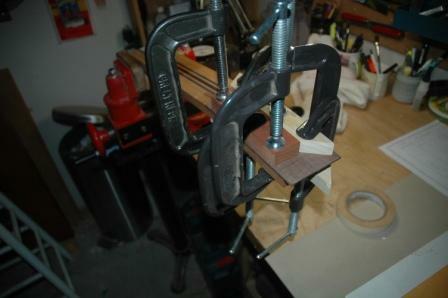 I prepped the top with shellac, and sanding it back clogs the sandpaper, which I have to change out frequently. 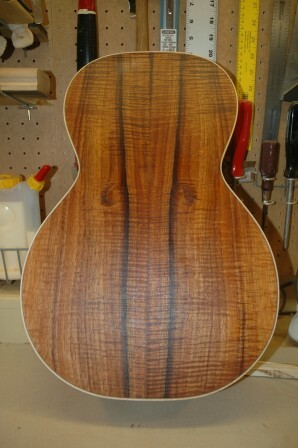 I really like the “eyes” on this back piece of wood, and the dark striping is a nice touch. The paua rosette and purfling turned out quite nicely. I have to thank Charles Fox for the tips on installing the purfling. 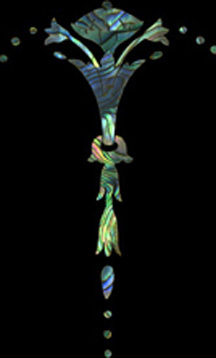 The koa headstock piece is nice and subtle, not to wild. This will be trimmed with paua as well. I need to procure some maple binding before proceeding. 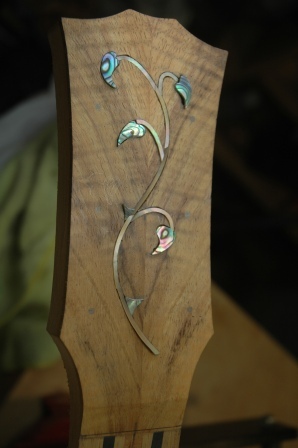 It will also have a nice vine and thorn inlay to match the fretboard. Finished the body binding and got it sanded down to near flush. Next tackle is the neck. 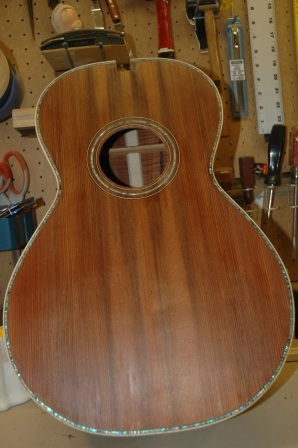 Added koa headplate and shaped headstock. Laid out the inlay in anticipation. sMg Guitars Copyright © 2019 All Rights Reserved.